Ella Mae Drews, 90, of Wausau, passed away on Monday, August 20, 2018, at Northcentral Health Care. 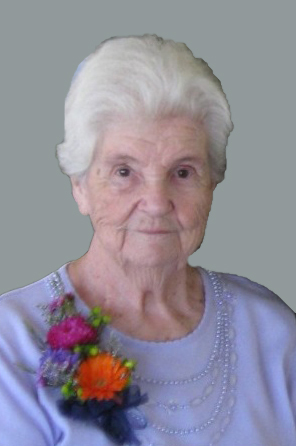 She was born on June 7, 1928 in Birnamwood to the late Raymond and Elmeda (Vaughn) Mosier. Ella married Robert Drews on April 10, 1948 in Birnamwood. Ella's hands were never idle. She was constantly creating and doing things for others. If you needed help with nearly anything, she was there for you. She truly gave of herself to her family, friends, neighbors, church, and work. A strong work ethic instilled early in life, showed in every task and job she did. "Work until the job is done" was her voiced belief. Through her adult years you could find her working in the cafeterias of St. Mary's Hospital, Johnson Hills, or waiting tables at the Bon Ton Cafe. She also worked at Rilling's Electric and Wausau Furniture. Ella's belief in God was strong and she was a longtime member of Grace United Church of Christ and for many years headed the Willing Workers at the church. Even though her life was busy, she took the time to look in on her neighbors and helped many of them with household chores, getting to doctor appointments, or taking them grocery shopping. She could be found cutting their grass or in the depths of winter out early shoveling their sidewalks, "Before all those kids head to school." Some of Ella's true loves were sewing, knitting, and crocheting, making everything from doilies to wedding dresses. She made untold numbers of baby afghans and was extremely proud of having created over 100 prayer shawls which were given to those in need. Survivors include her children, James Drews, Michael (Susan) Drews, and John (Patricia) Drews; seven grandchildren; six great-grandchildren; brother-in-law, Robert Marquardt; and nieces and nephews. She was preceded in death by her husband, Robert; parents, Raymond and Elmeda; brothers, Norman and Roy Mosier; sister, Marjorie Marquardt; and daughter-in-law, Carla Drews. A memorial visitation will be on Tuesday, August 28, 2018, beginning at 4:00 p.m. until 7:00 p.m. at Helke Funeral Home, Wausau. Entombment will be in Restlawn Memorial Chapel Mausoleum, town of Texas. In lieu of flowers and memorials to the family, please make a donation in Ella’s name to a charity that is important to you.